In calm winds, which runway should I select at an untowered airport? In calm wind situations, approaching an uncontrolled airport with no other aircraft reporting on CTAF, which runway should I select that would cause the least safety hazard? Especially at an airport with one runway, I don't want to set up to land head-on with an aircraft flying without a radio. Often uncontrolled fields will publish a preferred calm wind runway in the Airport/Facility Directory. When one isn't published the calm wind runway is usually the longest runway, which gives you a 50/50 chance at guessing right. To further reduce your likelihood of winding up face to face with another arriving aircraft you should self-announce on the CTAF and overfly the field to observe the traffic pattern. Also, turn on all the external lights 5 miles out. If there is traffic in the pattern you should work yourself into the same pattern everyone else is using. If the pattern is empty my personal practice is to pick the approach to the longest runway with the fewest obstructions, and ideally one that doesn't overfly residential areas (where it's practical to avoid doing so). You can talk about obstacles and runway lengths and not flying into the sun and all sorts of other minutiae that probably don't apply in calm conditions in a Cessna 172. At some point you've decided that there's no one in the pattern, but you're going to keep looking for traffic throughout the pattern just like you learned from your CFI, and you have to pick a runway. For me, I'll pick the one that requires the least amount of flying, just like the Hawker 800 pilot will do. 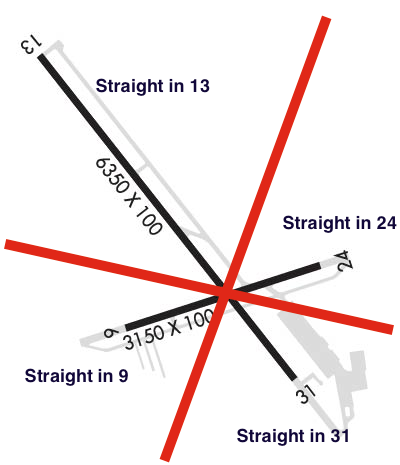 Straight-in approaches are always a topic for discussion. Under VFR conditions they are acceptable only if there is no conflict with other traffic. If I'm heading southbound, and there's an E/W-ish runway, I'll enter a long L or R base, regardless of which way traffic pattern is. If I care about the traffic pattern for some reason (obstacle or noise abatement), I'll make an overhead entry, which means overfly the airport and enter left or right downwind. In addition to voretaq7's answer, you could also check the terminal aerodrome forecast (TAF)/maximum elevation figure (MEF) and see what is the weather forecast. If it's IMC and the airport has only a single ILS, then takeoff from the runway with the ILS (since that's the runway IFR aircraft will be landing on). In regards to traffic avoidance, unless the airport has a preferred calm wind runway, there's not really a hard and fast rule for which runway you should choose. However, as you're approaching the airport, you should be looking for traffic both in the pattern and on the field. If there's traffic already in the pattern for a given runway, join that pattern. And, of course, if there's traffic on a runway, don't set up for the same runway in the opposite direction. Once you've selected a runway, continue to keep your eyes open. 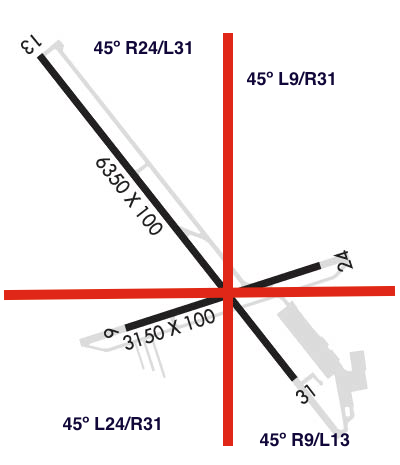 You should have a view of the runway for most of the pattern, so you should be able to see if someone without a radio also happens to not look out his window and lines up for departure on the opposite runway. While, as the arriving traffic, you should have the right-of-way over departing traffic, you'd obviously want to break off your approach if the runway is occupied. Not the answer you're looking for? Browse other questions tagged general-aviation radio-communications runways wind student-pilot or ask your own question. On a calm day, what determines the active runway? Is it legal to fly without a radio in Germany? What are good strategies for the “impossible turn”?